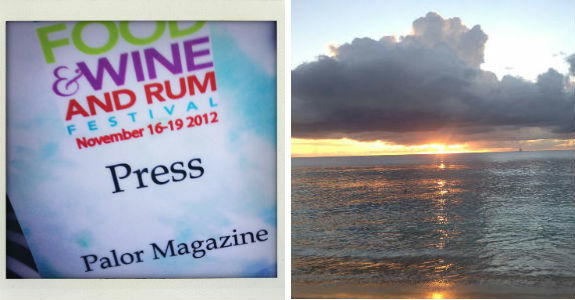 After our Real Girlfriends of The Barbados Food, Wine & Rum Festival experience last year on the gorgeous island of Barbados, we were ready for a new story to tell, and some nonstop Rihanna. Instead of staying at our usual private house in Christ Church parish, we offered our Eat, Play, Love travel deal for Parlouristas at The House, Colony Club and Tamarind Cove and soaked up some luxury resort experience during the 2012 Festival. From learning how to be a sommilier in an hour (aka drinking at 10 a.m.) with Josh Wesson, realizing that Barbados has shrimp the size of a forearm thanks to Anne Burrell and rum is great in a rice dish from Paul Yellin, we had a delicious good time. Here are the highlights from this year’s Barbados Food, Wine and Rum Festival. Shannon and I are November babies so we hosted a birthday celebration dinner at the lovely waterfront restaurant Cin Cin. After cocktails like the peach daiquiri that literally made one of our guests sigh in pleasure, we took our table next to the shore and ate several courses as the water lapped at the rocks below the restaurant’s swanky deck.